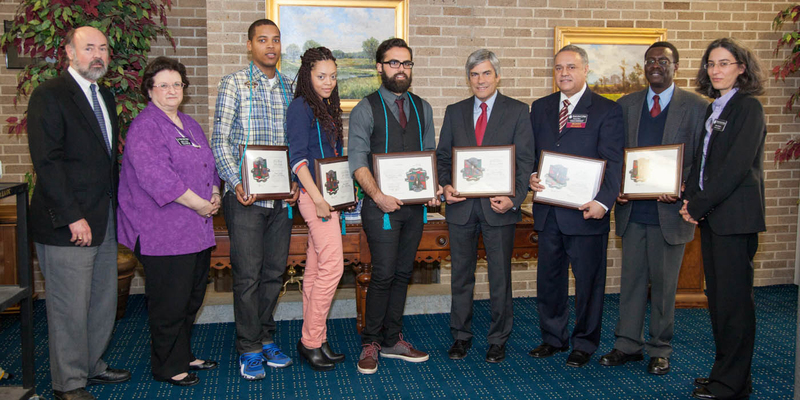 Rhode Island College’s Portuguese Studies Program inducted three outstanding students and three honorary members into the Sigma Chapter of the Phi Lambda Beta Portuguese Honor Society on Wednesday, April 9. The ceremony also included recognition of the 2014 recipients of the John A. and Mary V. Lima Scholarship in Portuguese Studies. 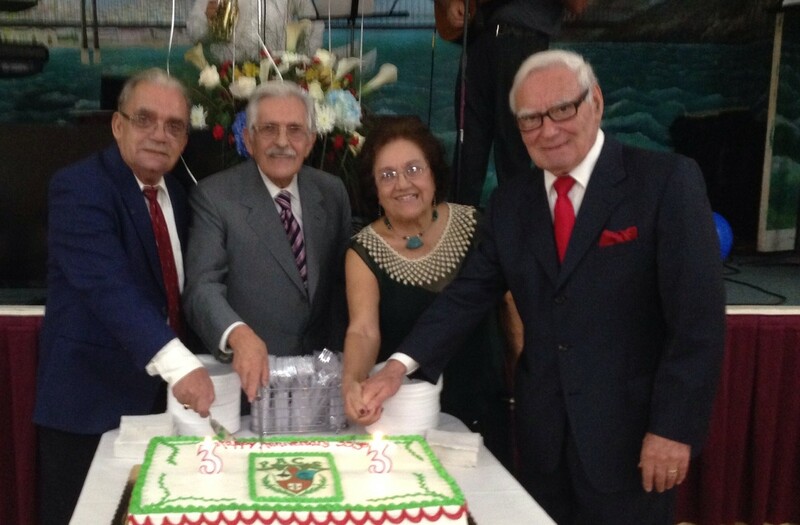 The National Portuguese Honor Society of Phi Lambda Beta, an auxiliary of the American Association of Teachers of Spanish and Portuguese, recognizes and honors outstanding achievement in the field of Portuguese language studies and Portuguese, Brazilian, African Lusophone cultures and literatures and their diaspora. This year’s honor society inductees are Denise DePina, a nursing major with a minor in Portuguese, from Wood River Junction, Rhode Island; Bruno Ramos, a biology major with a Portuguese minor, from Pawtucket, Rhode Island; and Justin Soares, a history/anthropology major with a Portuguese minor, from Rumford, Rhode Island. Members must be RIC students who have completed a minimum of three years of college Portuguese or the equivalent, including at least one course in literature. They are nominated on the basis of high scholarship, requiring a minimum grade point average of 3.25 in Portuguese courses, and a cumulative grade point average of 3.0 on a 4.00 scale. Honorary members are selected on the basis of high service, scholarship or advocacy in the promotion of Portuguese Studies, the Portuguese language and Portuguese, Brazilian and African Lusophone cultures at Rhode Island College and in the community. Bruno Ramos; and Christopher Barbosa, a Secondary Education/Portuguese major who is minoring in Spanish, from Cumberland, Rhode Island. This scholarship of $2,000 each is awarded annually to students who demonstrate high academic achievement and a commitment to studying Portuguese at RIC. Part of the Modern Languages Department at RIC, the Portuguese Studies program offers classes in beginner through advanced Portuguese language and in the literature and culture of all Portuguese-speaking nations. Enrollment in the program has grown nearly 50 percent over the past five years. Secondary and elementary education students who wish to specialize in Portuguese education may elect a major in modern languages with a concentration in Portuguese. The Portuguese Studies Program is supported by the Institute for Portuguese and Lusophone World Studies, a nonacademic center that awards scholarships and provides internship opportunities to Portuguese Studies students, organizes cultural and academic events and conducts research projects in Portuguese and Lusophone studies. For more information visit: www.ric.edu/portuguesestudies/ and www.ric.edu/iplws. Established in Providence in 1854, Rhode Island College serves approximately 9,000 graduate and undergraduate students through its five schools: the Faculty of Arts and Sciences, the Feinstein School of Education and Human Development, the School of Social Work, the School of Management and the School of Nursing. For more information, visit www.ric.edu.